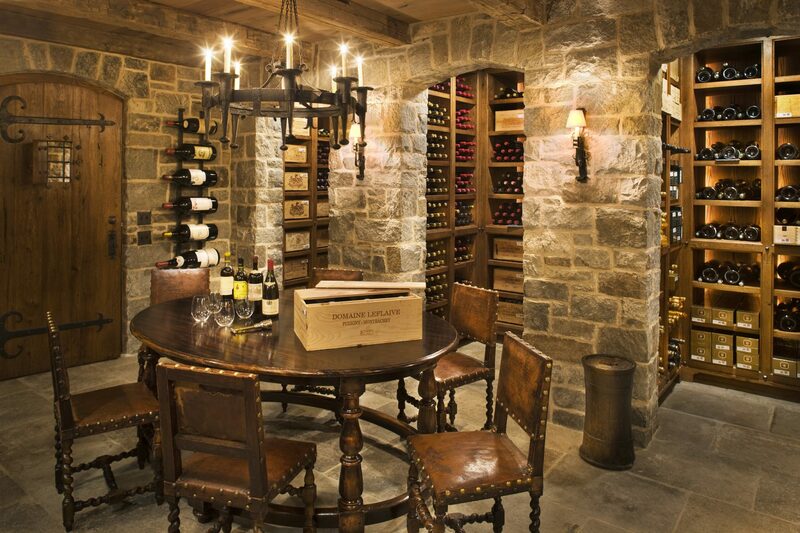 This 12,000 bottle wine cellar was created to house a collection of both rare and everyday wine for an avid oenophile. Designed for the basement of a country house, the stone walls and wood beam and plank ceilings are meant to evoke the foundations and framing of the house above; while the antique furniture and lighting were selected to give the rooms a European ambiance. The wine shelving, backlit with fiber optic lighting, was fabricated from antique oak and sized to accommodate both individual cases (on specially-made runners) or loose bottles, grouped together by wine type and vintage. Custom slate tablets were made to label groupings of vintages. The oval tasting table along with all of the custom iron work were designed by the firm and fabricated for this project. A back room designed for bulk storage is built around a large mobile shelving system, customarily used in libraries, set in tracks and allowing more compact storage in the limited space.